My Style or Your Style -- In ordering a custom knife, you can pick from the many patterns available or supply one of your choosing. 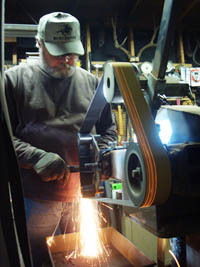 All Bear Bone knives are handcrafted by Rick Smith from start to finish. Every Bear Bone custom knife is photographed and documented to insure authenticity and collector value. Note: As a bladesmith I do not replicate specific patterns attributed to other contemporary knifemakers, however I can create a similar pattern that will resemble a particular style. Specializing in Authentic Period Knife Styles -- One of my specialties involves crafting authentic period style knives for Cowboy Action Shooters, Old West collectors and 1800 reenactment groups---including Mountain Men. I can make these knives from the same materials that were available during those eras. This includes following classic knife designs and patterns that are historically correct for the era. I can also adapt these classic designs to today's finest metals and materials. In every case, I construct these knives in the same fashion as the historical bladesmiths did, entirely by hand. Metals Used in Bear Bone Knives -- I have devoted much energy and effort into researching and developing the best way to hand craft quality fixed blade knives. In doing so, I have developed specific grinding techniques and selected high quality steel alloys from which to fabricate my custom knives. ATS 34 -- This is one of the highest grades of stainless steel commercially manufactured in the world today. It is a double vacuum melted alloy that has an advantage in both toughness and hardness over the popular 440-C stainless. 154 CM is also a good choice in the stainless category as is the long standing 440-C.
"01" Tool Steel -- This is my favorite high-carbon steel. When differentially heat treated and properly tempered it can achieve unsurpassed edge hardness. O1 steel has many excellent qualities. Critics of 01 quickly point out that it is not rust resistant. However, given the proper care, 01 steel will last a life time and develop the much desired "aged patina" look so favored by Cowboy Action Shooters, Civil War re-enactors and Mountain Men. Based on demand, I have used 01 high-carbon steel more than any other steel alloy to date. I have also used other high quality carbon steels such as 1095, 1084, 5160, 15N20 and L-6. Damascus Carbon Steel -- When properly forged and tempered, Damascus steel rivals many other steel alloys. Most people who favor Damascus are enamored with the multi-layer etched pattern these knives display. When done in an "old world" pattern, Damascus knives are both elegant and functional. Of course, you will pay more for a fine crafted Damascus blade. In forging a pattern welded Damascus knife, combinations of the following carbon steels are utilized: 1084 and L-6, 1084 and 15N20, or 5160 and 1095. Occasionally nickel is added to the mix also. Flat Grind, rather than Hollow Grind -- I prefer to flat grind most blades, even though this requires more effort. Tests have proven that a properly flat ground, single-edge blade is tougher, stronger and has better overall cutting capability than most hollow ground blades. It's strength comes from the fact that a flat ground blade has more mass supporting the edge. Because hollow ground blades have a thinner, weaker edge, they should not be used for tough chores. To do so will only increase the chances of tweaking or cracking the blade edge. However, if customer desires a hollow ground blade ---so goes the knife maker. The hollow grind does have it's place especially among the contemporary, small hunter, knife patterns. Convex Grinds -- Many of the top knife cutting competitors prefer a slight convex grind that is very near to a flat grind. The convex blade geometry seems to work better in today's cutting contests.Ican do a slight convex grind if the customer so desires and the extra cost is minimal. In crafting a custom knife, I always solder the knife guard to the tang, unless material or special knifedesign dictates otherwise. It is very important that the guard not come loose with use. When this happens. it usually leads to the demise of the entire knife. For guard material, I use steel, brass, nickel-silver, copper, and other high-grade metals. Another quality consideration involves knife handles. I personally select the best suitable materials available in today's market---from a host of exotic woods, sambar stag, horn, fossilized mastodon ivory, bone, micarta, etc. More importantly, on most models, I pin and epoxy the handles to the knife for durability. Choice of Finishes -- Bear Bone blades can bemirror polished, patina finished, or satin finished based on preference or use. There is no extra charge for satin finished blades. Solid to the Bone and Guaranteed for Life!